Did you know that you can receive medical services in French in Ontario? Throughout Eastern Ontario, and in a smattering of other places across the province, doctors are pleased to serve their patients in the language of Molière. 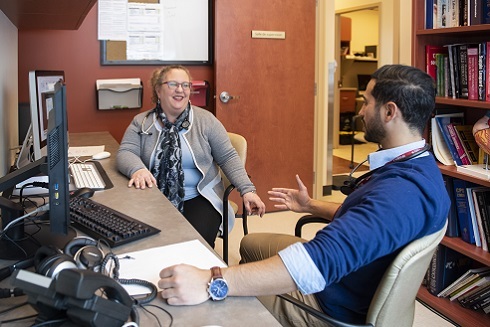 Many of these doctors have been trained by a uOttawa alumna who, for the past 30 years, has ensured that medical residents in Ontario have access to training in French. 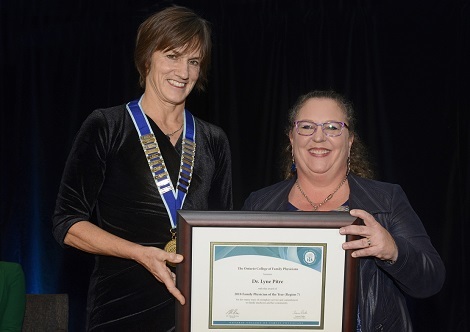 Dr. Lyne Pitre (BSc ’82, MD ’86) has a long association with the family medicine residency program at the Montfort Hospital in Ottawa, first as department head and then as family medicine program director. In 2015, she became director of medical education at the Institut du savoir Montfort, making her responsible for all medical residents and students. Throughout her career, she has trained, in French, more than 200 family doctors while also serving as an associate professor in uOttawa’s Faculty of Medicine. Dr. Pitre’s motivation to train the next generation of Francophone doctors has deep roots. Her father was an active member of the Ordre de Jacques Cartier, a secret society also known as La Patente that worked to advance the cause of French Canadians. As Montfort’s director of medical education, Dr. Pitre has set a new goal. She now wants to increase the number of specialist residencies at Montfort, namely in internal medicine, psychiatry, obstetrics, surgery, anesthesiology and orthopedics. Rather than being reserved for residents whose mother tongue is French, the residency program at Montfort welcomes at least one Anglophone resident each year. These residents seek to better understand Francophone culture while improving their own fluency in French. In addition to her work at Montfort and with the University of Ottawa, Lyne Pitre is the lead doctor of Montfort’s Équipe de santé familiale académique, the medical clinic she co-founded that is located steps away from the hospital. But despite these successes, the shortage of Francophone healthcare professionals in Ontario is far from resolved. Dr. Pitre, who was born at the Montfort Hospital and grew up in Ottawa’s Vanier neighbourhood, dreams of a day when Ontario will have enough doctors to serve all of its Francophones. “The province’s Francophones are aging and right now, only a minority of this elderly population are bilingual,” she says. Although the Ontario government recently decided to abolish certain French-language services, Lyne Pitre has no time for discouragement. “It’s very frustrating to see that, in 2019, we still have work to do, we still have to fight to maintain the status quo. But in the wake of these cuts, my Franco-Ontarian pride has only grown. Named 2018 Regional Family Physician of the Year by the Ontario College of Family Physicians. Recognized for her work in promoting medicine in French with the Prix de l’ambassadeur du français en médecine Jacques Boulay, awarded by the Association des médecins francophones du Canada, the association representing Francophone physicians in Canada. Received the Prix Ilios for career achievement at Montfort Hospital’s merit awards gala.